Last Night I was looking for an empty sheet of paper to write notes on. I pulled out a notebook I had not used at home or school for at least a month and a half. I worked my way back toward a blank sheet and suddenly found some reviews I had previously written. I went to my blog to see if I had already posted them and lo and behold I had not. My husband stood in the doorway to my office chuckling. He thought it was funny that I had misplaced eight book reviews. I kept thinking I was losing my mind. I knew I had read the books but couldn't find the book reviews. This is what happens when you have so many different notebooks for different purposes. You know, one for each of your WIPs, one for school, one for reviews. Then when that student who has no paper comes up and asks for some, you grab the first notebook you can get your hands on and then forget what you had done. So today we will start off with four of the eight reviews I had written. I know the authors will be happy. They must have thought I had forgotten them. I am trying to get things caught up and organized so that I can start the new year fresh. This was very appropriate for this time of year. I know God allows things to happen for a reason. We look at Christmas as a time for giving. We give to others all the time but, how often and how much do we give to God. In this book the author takes us on a short course of tithing. He started off defining stewardship and giving examples. God promises to bless us. There are examples all throughout the Bible of God doing just this. The author points out that tithing is a privilege and that it is a symbol of total service to the Lord. It show our willingness to serve him wholly. For me Chapter 6 was the most important in the entire book. It was full of budgets, and worksheets and all the things I truly need to get myself back on track. I have no credit cards. My philosophy has always been if I didn't have the cash then I didn't need it. Unfortunately this book made me look at my spending habits. When I got paid the first thing I would do is buy books. It didn't matter that I had 300 unread books on my shelf, I always bought more. I would buy 2-4 books a month. That may not seem like much but when you have nothing to start with and you are spending what you don't have it adds up. This is a book I will definitely recommend to friends. It is a book that Christian and Non-Christian alike can benefit from. I am thankful the author sent me a copy for review, even if I did lose the review. Magic without the hocus pocus, these stories explore the ethereal blur between reality and not, between dream and sleep, between love and 'other than' love. They present relationships with a tender wackiness. Tossed into the mix are mischievous ghosts, who give the talking plants and even the seductive and vocal grains of sand a run for their money. Quirky and offbeat, these stories will touch your heart, although they may tug at your funny bone first. 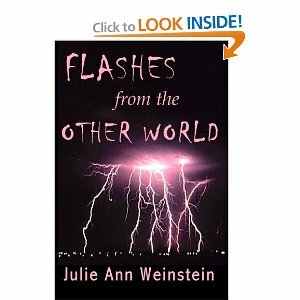 Julie Ann Weinstein has published over ninety short stories and is a Pushcart Nominee. She is an editorial consultant and a flash fiction workshop leader in the Southern California area. Julie is also published under the name Julie Ann Shapiro. She currently lives in Encinitas, California, where she is working on future short story collections. This is metaphorical writing at its best. The author has divided her book into three parts. Part one is a collection of paranormal stories. The are very short and bizarre. Not bizarre in a bad way. Bizarre in the sense they make you think. They have a depth to them that makes you wonder if there is a deeper meaning, a hidden meaning. The second part of the book is called relationships. The first story grabbed me and made me hold on. Maybe it is because my mom has to live with me now that I could see parallels between the relationship the daughter had with her mother and my own. It takes great talent to write from the heart and attain such a deep meaning that will be read and interpreted differently by each reader. The third part of the book is called Surreal. I enjoyed “Blue Moon Carbs”. This is a book where the reader is free and encouraged to make all kinds of connections. As I try to lose weight this one story stood out. It felt like I was reading the battle that goes on in my head every time I eat something that could potentially cause me to gain weight. I loved it. My favorite part of this book was actually in the back where the author explains what inspired her to write each of her stories. Her explanations made me go back and re-read some of the stories as I looked at them through the eyes of what inspired her. It put a truly different spin on it. This is not an easy book to describe. I will recommend it. Just don’t pick it up for a quick read because that is the one thing it is not. Have you ever wished something bad would happen to someone evil because God and the law took too long? There are those that risk it all for the rest of us. This novel is about those few and the risks they take on our behalf, and the bystanders that unwittingly get caught in the fray. Duplicity, is the exquisite yacht manned by such men. 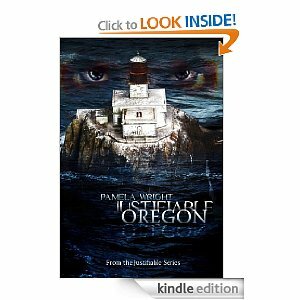 Men intent on luring the world’s wealthiest human traffickers out of their million’s and into their final moments on earth inside Tillamook Rock Lighthouse. After reading the first few chapters the “Dexter” series came to mind. In case you don’t remember it, or you’ve never seen it, Dexter was a cop who worked in the police lab. His specialty was blood. At night he hunted down and killed those who managed to get off for some technicality, and justice was served. Often we hear cases of criminals getting off scott free. What if there was a force that took care of those criminals that were put back on the street? In Justifiable Oregon that is just what happens. There is a group of people who take those very criminals out to the Tilamook Rock Lighthouse in Seaside Oregon. There the criminal arrives drugged up. As they come to they are tortured and then their bodies are cremated. Who are these criminals? They are members of a drug cartel, and those who traffic in humans. Want to know more? Read the book. Be forewarned that this is not a book you can start and stop at will. This is a book that demands to be read from beginning to end. The setting of this book sets the over all tone or mood. It is freezing cold, and snowy. That is exactly how this story leaves you feeling, cold and empty inside. You have Emily who is best friends with Gabby. But what kind of friend flirts with your boyfriend? Emily does. She is sure that she and Zach are made for each other. First reason to hate a character in this book. Emily is selfish and so full of herself. Then we have Chase who is not financially in the same league as the rest of his friends. He tries to make up for his past by becoming something he really isn’t. He tramples on people to get where he wants to be. 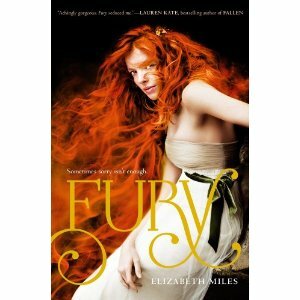 To make Emily and Chase pay for what they have done to others the three furies Ty, Meg and Ali pay a visit. Ty is so hot that she has Chase fawning all over her. Can you say revenge. The job of the furies is to seek revenge for those who they feel need it against those they deserve it. This whole book has a creepy movie feel to it. I could actually see it come out on the big screen. Although the characters so so many wrong things and justify it to make you hate them they are so wonderfully developed you can’t help love them. This is the first book in this series and it will definitely not be the last one I read. The ending definitely leaves you hanging for more. Definitely one to recommend to all of your friends who like creepy, paranormal, mythical type things.